Such a huge amount of planning goes into the weeks and months leading up to a baby's arrival. Most of the planning involves making sure baby has everything necessary to make it through those first few months. Somehow, the parents get lost in the shuffle. With baby #1, I did not do an awesome job of taking care of myself. I didn't eat enough, didn't sleep enough (although, who does with a newborn in the house) and because of that I wasn't able to take care of our new little one to the best of my ability. Yes, we were in a foreign country without family nearby to help us out, but the little things like having energy boosting snacks within arm's reach would have made a world of difference. Fortunately, I realized the importance of this seemingly small thing and was able to crawl out of the haze that had been the first month of motherhood. This time around, I tried to be as prepared as possible by making some healthy snacks that can easily be eaten one-handed (an important requirement when you have a newborn). There are big jars of Maple Soy Roasted Almonds in different rooms of the house right so I can grab a handful at any time. This guy may only be a week old, but it hasn't taken long for me to appreciate having snacks like this at the ready. Side note: I'm hopelessly in love with this guy. He is the sweetest. Watching both boys together may break my heart a little simply because there is almost too much love happening. 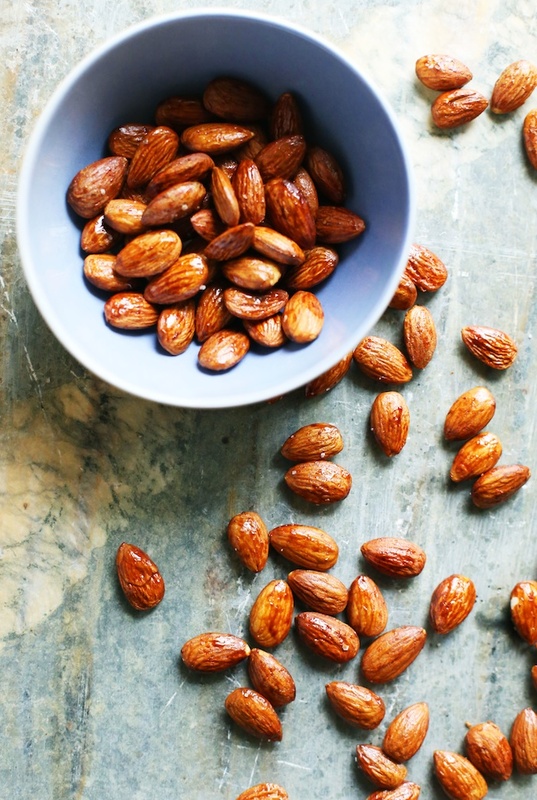 These almonds are so easy to make and store well in an airtight container. They are a little fancier than eating plain almonds but they aren't overwhelmingly coated in the maple soy glaze. Sweet, salty, and crunchy snack-time perfection. Yes please! 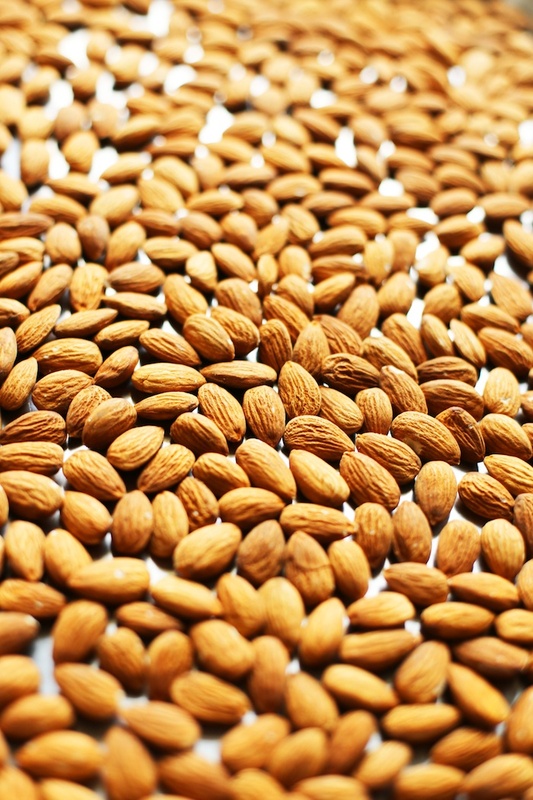 Spread the almonds in a single layer on a large rimmed baking sheet. Roast the almonds for 8 minutes to lightly toast them. Meanwhile, stir the soy sauce and maple syrup together in a large bowl. Add the almonds to the bowl and toss to coat them in the sauce. Line the baking sheet with parchment or spray with cooking spray. 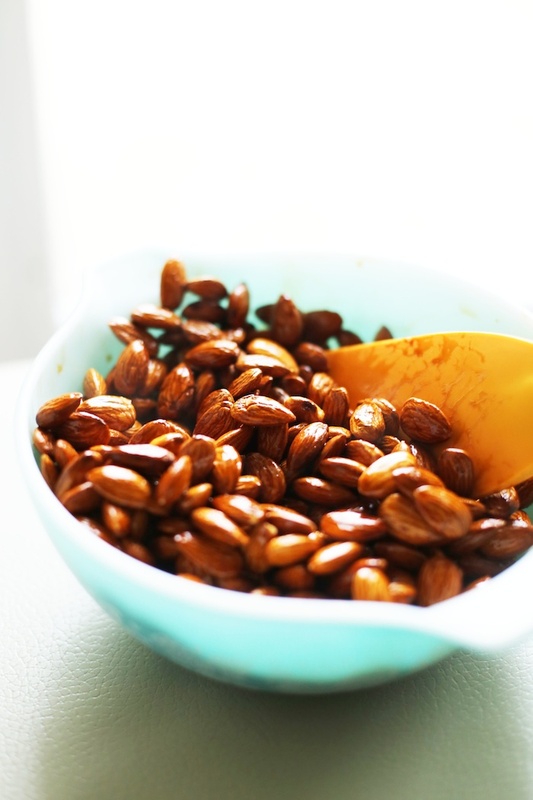 Use a slotted spoon to scoop the almonds onto the baking sheet and spread in a single layer. Roast the almonds for 15 minutes, stirring once halfway through. Sprinkle the almonds with the salt and let them cool slightly for about 2-3 minutes, then transfer them to a large plate to cool completely before transferring to an airtight container.